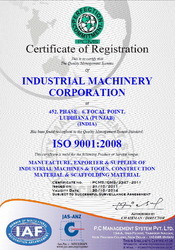 Established in the year 2011, We, Industrial Machinery Corporation is an ISO 9001:2008 certified manufacturer, trader, exporter and supplier of Threading Machine. We also manufacture Lathe, Milling & Drilling Machine. The offered products are manufactured by our experienced engineers and technocrats using premium quality components. These products are outcome of advanced engineering techniques and are manufactured in various specifications. Offered array of our products is worth admired due to its accurate dimensions, higher efficiency, low repairing cost and sturdy construction. Well-equipped with a robust infrastructure, we are able to easily accomplished the specified tool requirements of the industry. For attaining consistency in our quality, our machinery is regularly upgraded. Further, all our products are rigorously tested as per the globally approved quality standards before their final delivery to the customers. Due to this, we have managed to have a huge client base that is spread all over the globe. Our efficient team looks after the requirement and scope of improvement in the product range according to the customer’s suggestions and changing market trends. We have garnered a flourishing success rate with the support and contribution of the CEO of our company, Mr. Davinder Jit Singh. Under his strong-willed efforts, we have been successful to supply our products in domestic as well as international market. His sharp business sense and expertise supports us to carve a niche in the concerned area. Manufacturing, Trading, Importer and Exporter of Industrial Machines. We are blessed with three advanced manufacturing units that are set-up strategically. Our infrastructure facilities are outfitted with high grade machinery and urbane technology. In order to fabricate our products in terms of globally set quality standards, we have employed qualified professionals who are capable of handling our latest machinery. In this way, we are able to provide high precision tools and equipments. Further, machinery used in manufacturing process is upgraded on regular intervals. Considering the customers as precious asset for our organization, we are dedicated to offer absolute client satisfaction. By maintaining cordial relations with our customers, our organization is able to build long lasting bonding with them. Supreme grade industrial equipments and tools are offered to our customers located all over the world. We have managed to keep our customers contended by offering timely delivery and by providing easy payments facility to them. Due to our customer centric approach, we have become noted entity in this domain. With the presence of a skilled and proficient team, we are able to earn rapid success rate in the industry. Considering the significance of a diligent team, we have appointed qualified engineers, managers, technicians and workers in our team. With the support of our qualified team, our firm is able to attain satisfactory results regarding the quality of machinery as our professionals are specialized in the concerned area. Moreover, testing of products is well supervised under the controlled atmosphere of our quality examiners.